Police arrest three suspects; Arab and Muslim communities join chorus of condemnation from a swathe of Australian society. This account of the dreadful antisemitic attack in Bondi from HAARETZ, on 26th Oct 2013, appears to be the only one that gives any account of the incident from the victims. Further discussion and speculation on this, I feel should be left until December 3rd after the arraignment of the 23 year old. 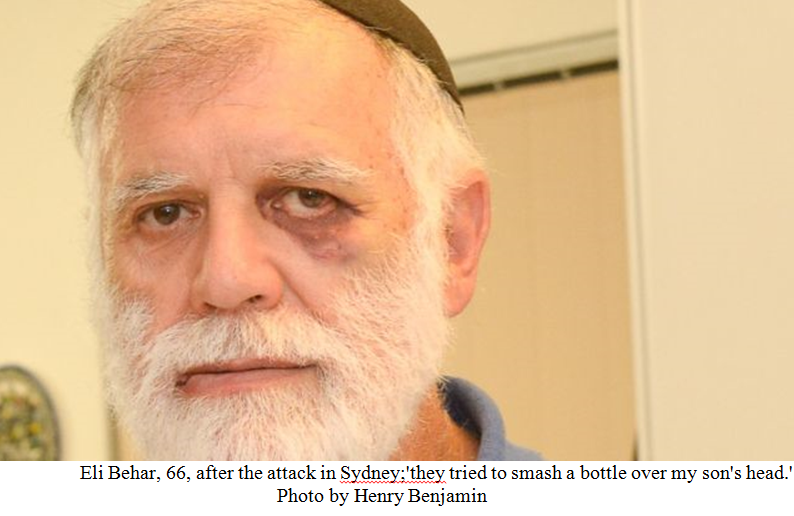 Four members of the Behar family and Shlomo Ben Haiem, an education shaliach of the Jewish National Fund, were wounded in a violent fistfight after they were taunted by a mob of eight youths in Bondi Beach. All five were hospitalized, but have since been released. Eli Behar, 6 6, who moved here from Israel in the 1980s, suffered bleeding on his brain while other injuries included a fractured cheekbone, broken nose, concussion, lacerations and bruising. Two minors, both 17, were arrested and charged with affray and breach of bail. They appeared in the New South Wales Children’s Court on Monday via video-link from their cell and were ordered to reappear on November 12. A third man, aged 23, is scheduled to appear in court on December 3. Police are still searching for other gang members. Community members described the attack as the worst of its kind on a group of Australian Jews since records on anti-Semitic incidents began in the 1980s. 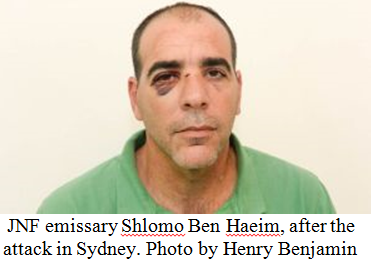 Ben Haiem, who served in an intelligence unit in the Israel military, told Army Radio on Sunday. “I’d never seen such a thing in my life. he said in a statement issued by the JNF. It is understood that the victims have been advised by lawyers, the New South Wales Jewish Board of Deputies, and local police not to give any further media interviews. Instead, they issued a joint statement on Monday, saying they wanted justice, not vengeance. Representatives of the Arab and Muslim communities joined the chorus of condemnation from a broad swathe of Australian society on Monday. said Maha KrayemAbdo, executive officer of the Muslim Women’s Association. Randa Kattan, CEO of the Arab Council of Australia, wrote to the NSW Jewish Board of Deputies. “The Bondi incident highlights the need to deter and punish racial harassment and vilification. In Israel, Naftali Bennett, Minister for Diaspora Affairs, said he spoke to the president of the NSW Board of Deputies, Yair Miller.